BOOK NOWFill Out Our Form To Reserve Your Spot Today! Taking your RV on the road is an exhilarating experience, but sometimes you just need to kick up your feet and relax for a little while. Located by Lafayette, Louisiana, the Frog City RV Park is the perfect stop on your cross-country adventure. Check out why our place makes such a great choice. Just because our RV park is located deep in Cajun country doesn’t mean that you can’t find it. Located just off I-10 in Duson, it’s only about ten miles west of Lafayette. If you’re traveling west to Texas, this could be your perfect rest stop. We pride ourselves on our family-friendly community, which is very safe. Our friendly employees will make you feel right at home here. Would you like to cool down in our outdoor swimming pool? Whether you simply want to sunbathe or want to swim laps, be sure to take advantage of our lovely pool. When you’re on the road, access to laundry facilities can be few and far between. When you camp out at our RV park, you’ll be able to finally do some laundry in our coin-operated laundry facilities. Nothing feels better than a suitcase full of clean clothes. RV showers can feel quite cramped, so why not use our private hot showers instead? We make sure to keep our facilities as clean as possible for your comfort. Is Dog your copilot? If so, Fido is welcome is welcome at our campgrounds. Although we don’t allow pit bulls, Dobermans, chow chows and rottweilers, all other dogs are welcome, and we even have a dog walk area for you to walk your leashed dog. If you are ready to win big or at least have fun trying, walk on over to the Lucky Deuces Casino. Featuring all kinds of games and slot machines, you are sure to have a good time here. Located on the same premises as the casino is Roady’s Truck Stop, which is considered the “Best of Acadiana.” If you love all things Cajun, check out the gift shop. At the truck stop, you’ll find plenty of food take back to your RV and nosh on. If you would like to venture out a little ways, consider stopping by Vermilionville, which is only about 16 miles away. Covering 23 acres and featuring 19 attractions, this park is dedicated to educating people about the Acadian, Creole and Native American cultures. Check out the crafts made by local artisans and the seven original restored homes. Whether you decide to venture out to the Casino or stay in and work on your laundry, you’ll feel relaxed and renewed when you stay at our Lafayette campground. Take the entire family with you, including your beloved dog, for your next RV trip. With our famous Cajun hospitality, you’re sure to feel welcome at the Frog City RV Park. What are you waiting for? 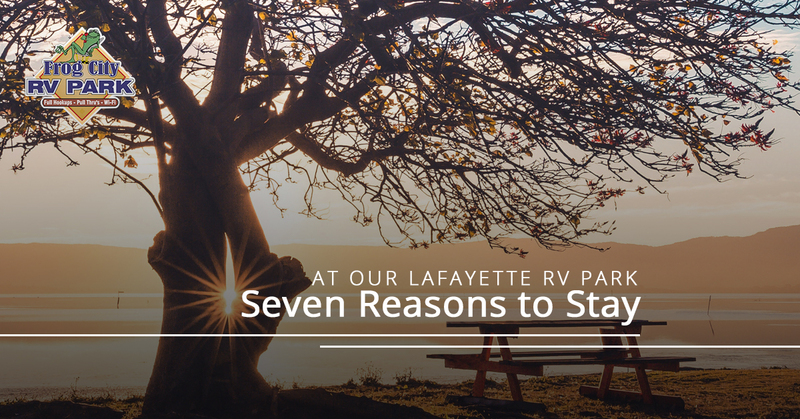 Contact our Lafayette Campground today to book a site for your next big adventure! Please enter a number from 1 to 4. Please enter a number from 0 to 2. Rates are based on 4 people per site. Additional charges may apply if over 4 and are subject to management approval.